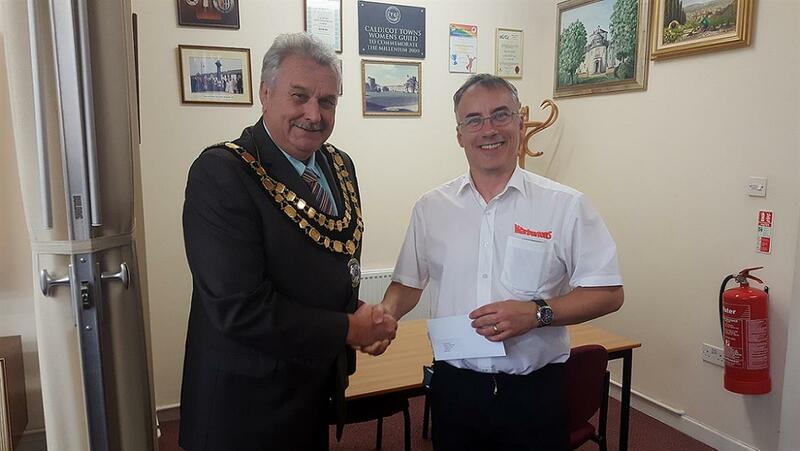 Mayor, Cllr O Edwards presented a cheque for £2,500 to Caldicot Community Lunches. This was a donation to assist with costs of providing the lunches. 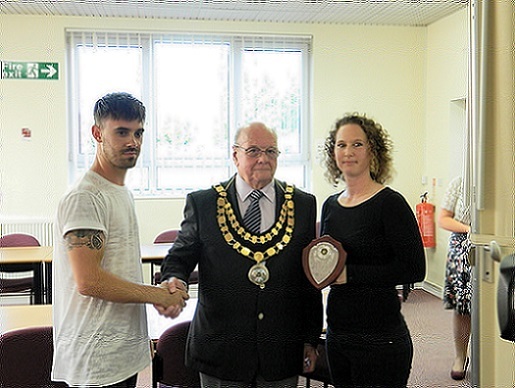 Mayor, Cllr Oliver Edwards, presented a cheque of £500 to Caldicot Library. This was a donation to fund prizes for the Summer Reading Challenge 2018. Caldicot Town Council installed a new piece of disabled accessible play equipment in the play area at King George V Playing Field. 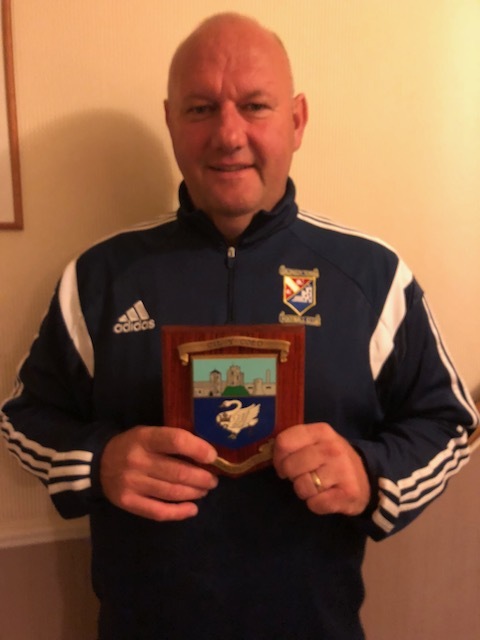 Cllr O Edwards, Mayor: "I am pleased to officially open the new piece of play equipment which allows children of all abilities to enjoy the play area at King George V Playing Fields". 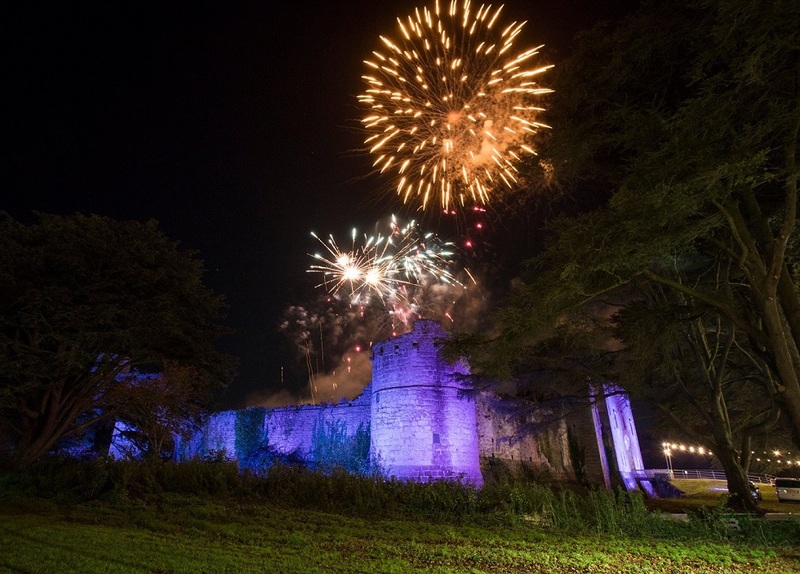 Cllr M Mitchell: "Very pleased that Caldicot town Council is forward thinking and promotes inclusivity". 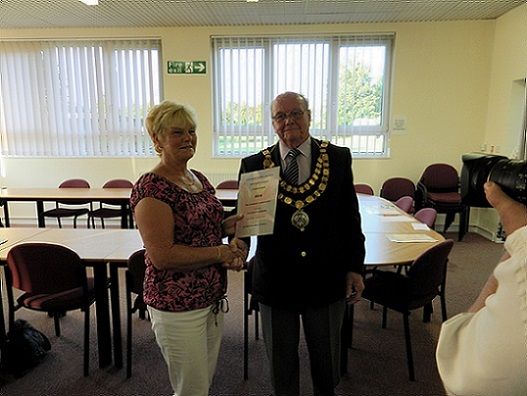 Past Mayor, Cllr P Stevens presented a cheque for £1750 to Barnardos. This was a donation from his Mayors Charity from the Civic Year 2017/ 2018. 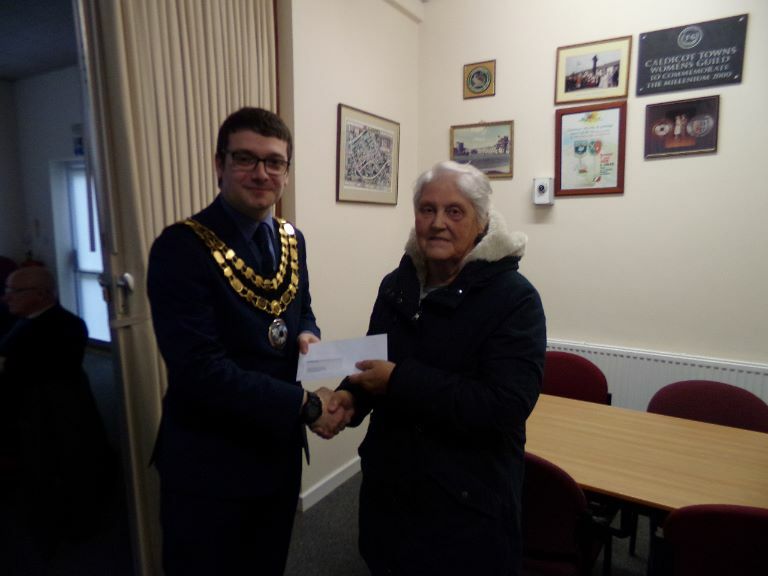 Mayor, Cllr P Stevens presented a cheque for £500 to Caldicot and District Royal British Legion. This was a donation to assist with costs of the Great Pilgrimage 90 trip to Ypres. Mayor, Cllr Philip Stevens presented a cheque of £400.00 to Blue Phoenix Chldren's Marching Jazz Band. This was a donation to assist with costs of transport for competitions. Mayor, Cllr Philip Stevens, presented a cheque of £400.00 to 3rd Caldicot Brownies. This was a donation to assist with costs of a pack trip for the brownies. 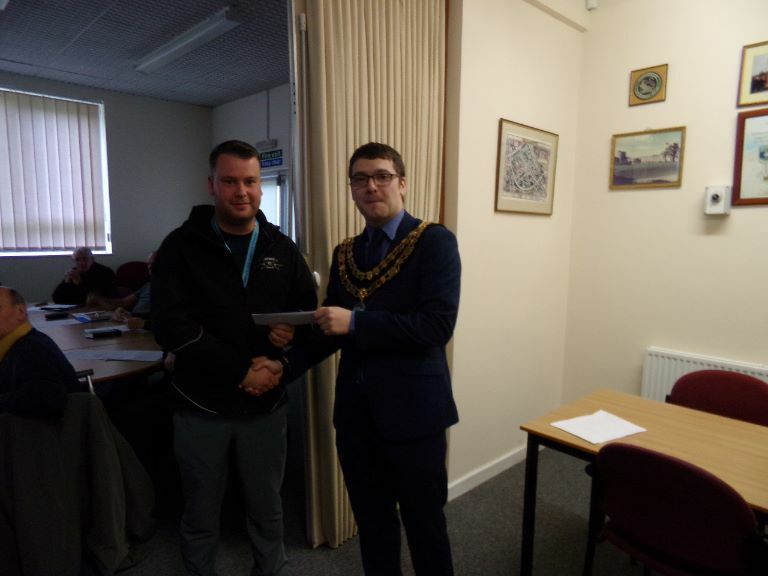 Mayor, Cllr Philip Stevens, presented a cheque of £5,000 to Cllr Alun Lloyd, Caldicot Town Council's Representative for Caldicot Youth Group. This was a donation to help the Youth Group continue to deliver services to the children of Caldicot. 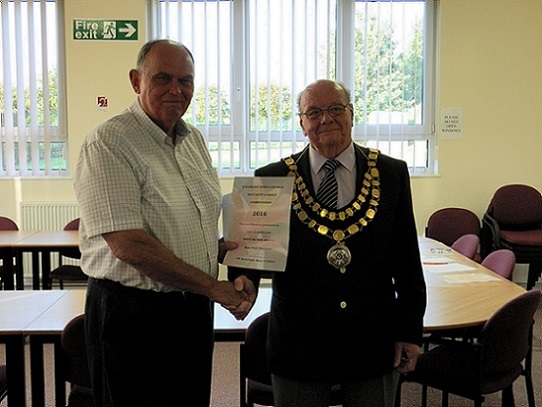 Mayor, Cllr P Stevens, Presented a cheque for £10,000 to Mr Brian Counsel of Monmouthshire Citizens Advise Bureau. This was a donation to assist the CAB in continuing to deliver an excellent service to the residents of Caldicot and Monmouthshire. 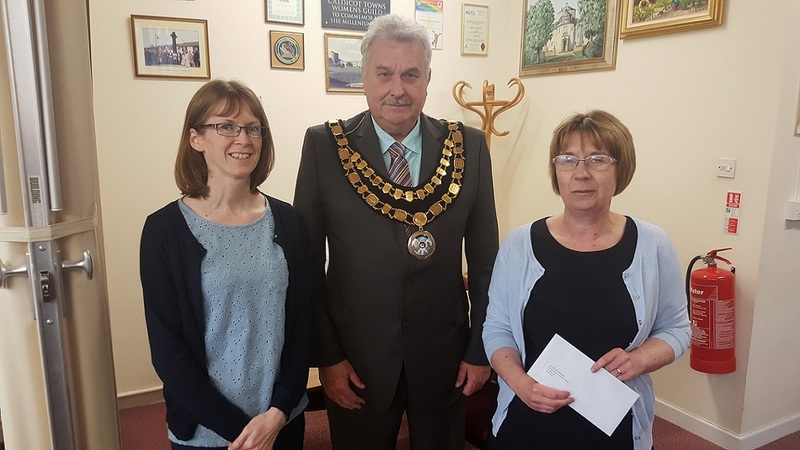 Mayor, Cllr P Stevens presented a cheque of £8,000 to Caldicot Events Committee to fund the Summer Carnival and Christmas Light Switch On Event 2018. Mayor, Cllr Philip Stevens, presented a cheque of £500.00 to 2nd Caldicot Scouts. This was a donation to assist with costs for a Scouts trip to Ypres. 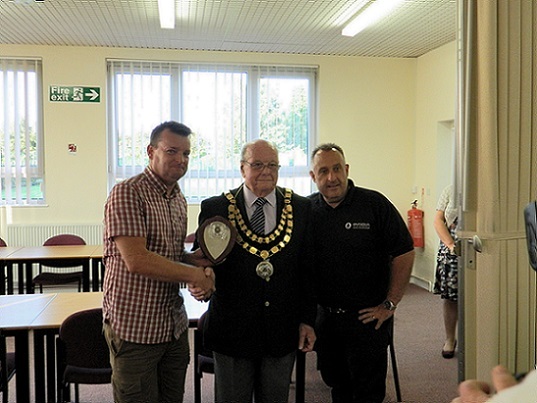 Mayor, Cllr Philip Stevens, presented a cheque of £500.00 to Severn Area Rescue Association (SARA). This was a donation to help purchase a new vehicle to assist with search and rescue operations. 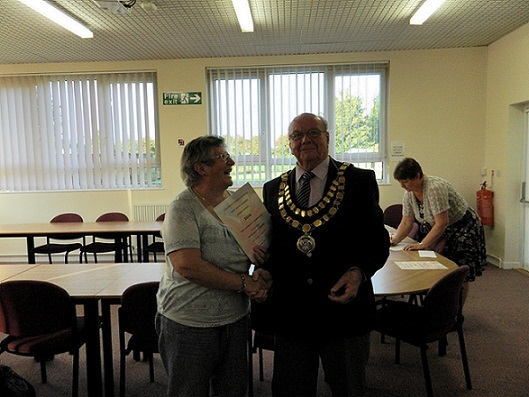 Mayor, Cllr Philip Stevens, presented a cheque of £200 to Caldicot Library. This was a donation to fund prizes for the Summer Reading Challenge 2017. 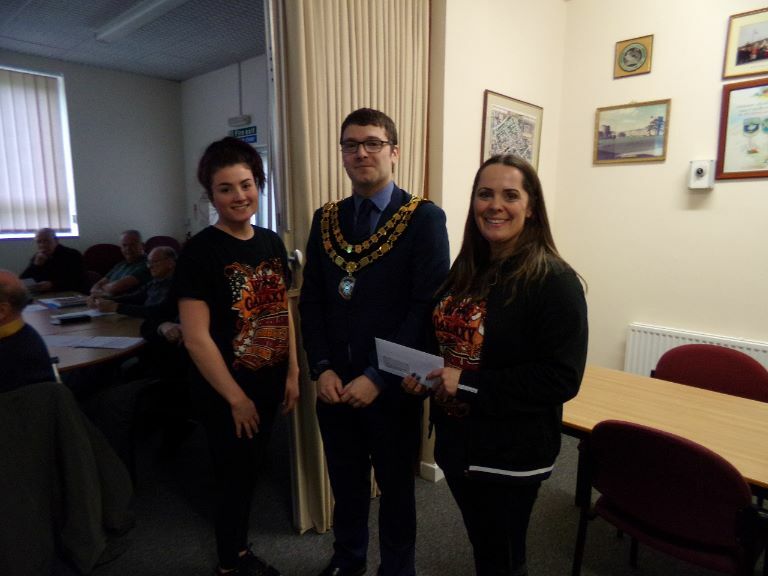 Mayor, Cllr Philip Stevens presents a donation of £1000 to Rachel Nee, Treasurer and Cadet Silcox. This donation was to assist the Air Training Corps in purchasing new equipment. Mayor, Cllr P Stevens and Deputy Clerk S King with the 'One Voice Wales Award' Commended for Town Council Annual Report. 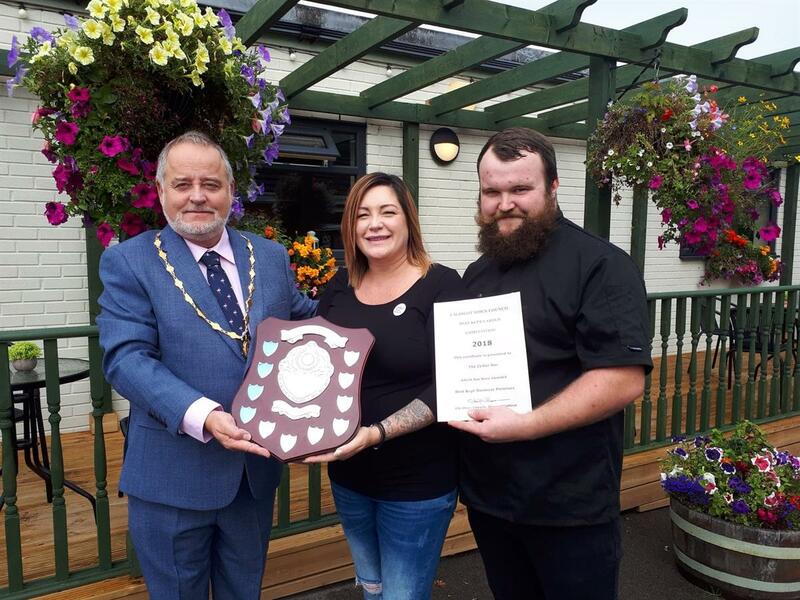 Mayor, Cllr P Stevens and Communication Assistant C.Till with the 'One Voice Wales Award' Commended for Town Council Website. Mayor, Cllr Philip Stevens is presented a photograph of World War Two veterans from Caldicot at a Coming Home party in 1945. The Mayor thanked Cllr D Ashwin for his efforts in finding many of the names for those in the photograph. 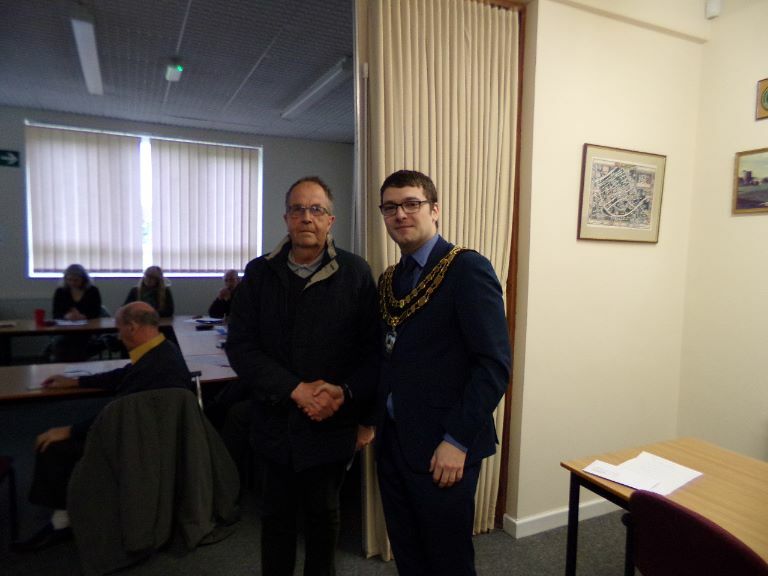 Two representatives of iNeed attended Caldicot Town Council meeting on Wednesday 27th September and presented to Town Council. 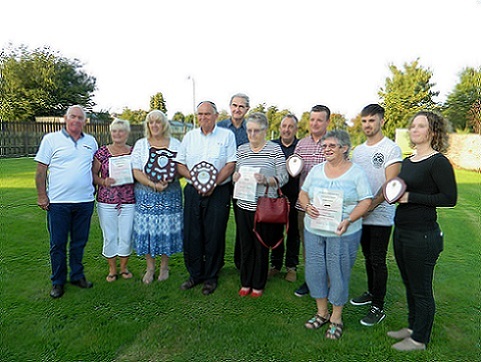 iNeed thanked Town Council for the support over the past 18 months, particularly after the charity did not have a base and allowing use of the compound building for storage and sorting of items. The charity had sent 3 huge containers to Syria and collaborated with a Cardiff group. iNeed were continuing their work, from a temporary base in Chepstow and again thanked Town Council. 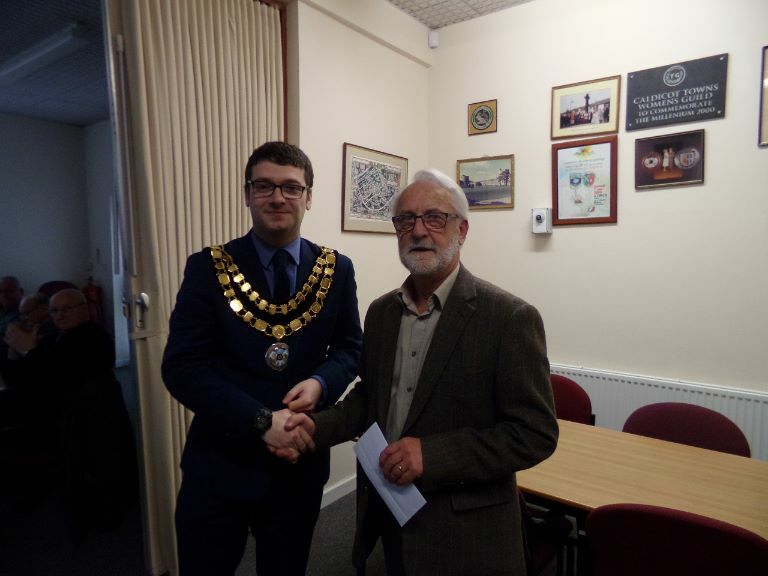 In recognition of Town Council support, for iNeed refugee support, representatives presented the Mayor with a copy of a picture, part of an art exhibition ‘from Syria with love’ which had been produced by a young Syrian child living in a refugee camp in Lebanon. 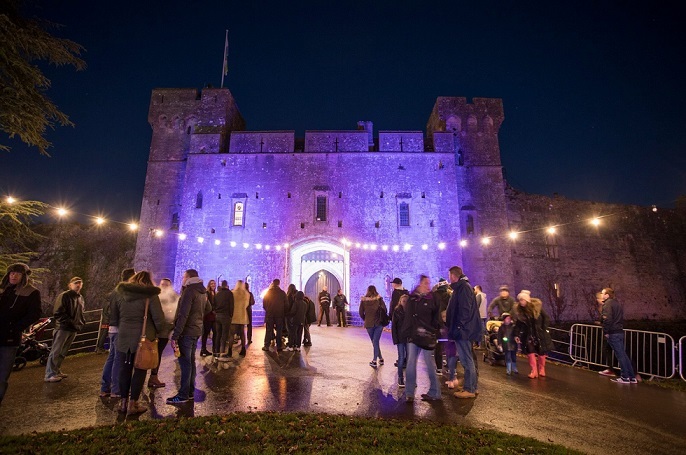 The picture will be displayed in Caldicot Town Council building. Past Mayor, Cllr D Evans presented a cheque for £700 to St David's Hospice Foundation. This was a donation from his Mayors Charity from the Civic Year 2016/ 2017. 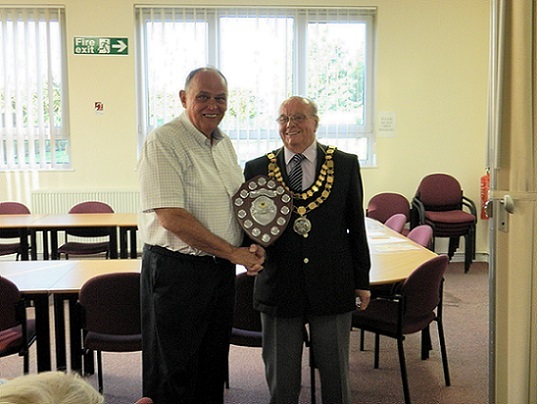 Past Mayor, Cllr D Evans presented a cheque for £700 to Chepstow Parkinson's. This was a donation from his Mayors Charity from the Civic Year 2016/ 2017. Mayor, Cllr P Stevens has said "Thoughts are with families and those who were injured or lost".